This five piece Art Deco period bedroom set from about 1935 includes a queen size bed, tall chest, dresser with mirror and two nightstands. Diamond matched mahogany, maple, zebrawood and inlaid banding all have beautiful grain. The restored finish is in excellent condition on this American made vintage furniture. Drawers have dovetailed joints and original hardware with bakelite inserts, except the nightstands which are compatible but slightly different, see photos. The bed has been expertly adapted to fit a standard queen size mattress. Wood support members underneath are included. The demonstrator mattress and spring unit in photos are 18" thick together. 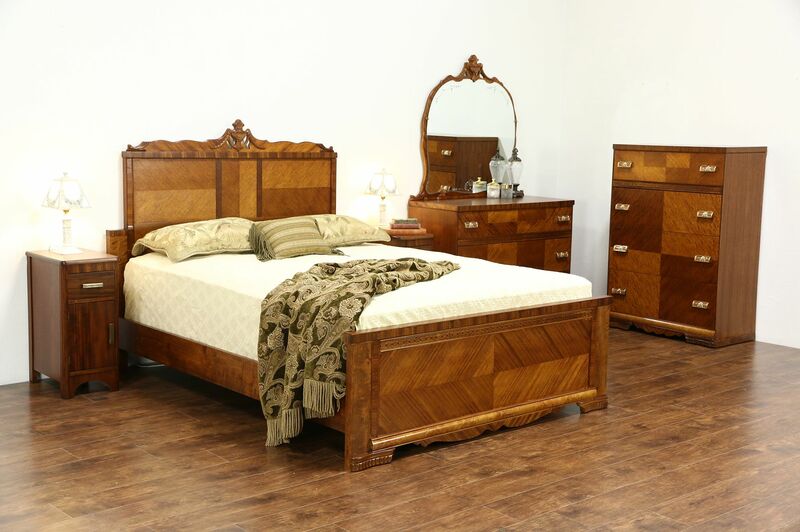 The bed measures 85" long, 65" wide, the headboard is 56" tall and the footboard is 22" high. The dresser has a shaped and beveled mirror with reverse carving. Size is 44 1/2" wide, 21" deep and 74" tall, the base is 34" high. Tall chest size is 34 1/2" wide, 19" deep and 50" tall. Nightstands are 12" wide, 18" deep and 27" high.